Ritchie Blackmore has long been known as the masterful guitarist of two of the most legendary bands in rock music - Deep Purple and Rainbow. But close followers of the guitarist will tell you that the work with his current band, Blackmore's Night, is his most adventurous excursion yet. Blackmore, singer Candice Night, and their merry band of minstrels have been knocking out their unique brand of Renaissance music for over 10 years now. I recently had an opportunity to see the band at House Of Blues in Chicago, and at the end of the show I remember wishing I had a recording of some kind. Well, wishes do come true in many different ways, as this spectacular DVD, "Paris Moon," captures the band live in Paris, just as they were that night in Chicago - at their very best. Now, you would think that guitar legend Ritchie Blackmore would be the focal point of the band's live shows. A funny thing seems to happen at a Blackmore's Night concert though, and her name is Candice Night. With the voice of an angel, and exquisite beauty to match, Candice Night plays the most gracious of hostesses here, and never once finds herself being overshadowed by the guitar god. You get a true sense of comfort radiating from both Ritchie and Candice as they gently interact here. You can clearly see the love and respect that they have for each other, and the love and respect that they have for the music. The concert often plays like a raucous night at an English pub, especially during the sing along tune, "Home Again." After Night comically points out Blackmore's divorce history in verse, keyboardist Bard David of Larchmont belts out a drinking song. The crowd rises to its feet and claps and sings along with great fervor, and it is then that the spirit of the music really takes flight. Other great moments of stein swinging crowd participation are "Renaissance Faire," "Under A Violet Moon," and "Loreley." When the band isn't inciting the crowd, they can be found doing songs like "World Of Stone" with an intense ferocity. After watching the performance of the latter, you have to ask if there has ever been a more well written song. It is just a spine tingling moment. The band does run through a couple of cover songs during the set, but they might not be what you might expect. The Deep Purple song that the band chooses to cover is one that comes from David Coverdale's time in the band. It's the great ballad, "Soldier Of Fortune," and Candice Night makes it her very own thing of beauty. Jethro Tull's "Rainbow Blues" and the Joan Baez classic, "Diamonds And Rust," go off just as perfectly. Look for a few instrumentals that'll just rock your socks off, too. Besides an amazing keyboard solo just past the middle of the set, you can find an extremely impressive bass jam by Sir Robert of Normandie during "Durch Den Wald Zum Bachaus." Numerous times throughout the concert we see Night picking up various Renaissance woodwind instruments and playing them with perfection. Candice Night is someone you can't take your eyes off of. She is also someone that melts your heart when she sings. Perfect tone and incredible vocal strength are abound throughout each and every track here. Gillan......Dio.......Joe Lynn Turner......they were all a great fit for Blackmore, but Night just might compliment Ritchie's playing better than anyone. Toward the end of the set, which runs over 2 hours in length, we see Blackmore trade in his acoustic classical guitars and opt for the cream colored strat that he is so famous for. As he cranks out the complex solo of "Ariel," and he hits the heavy chords of "Saint Teresa" from their latest "Village Lanterne" release, it's a real thrill to watch the man with the smoothest left hand in the business do his thing. Blackmore's playing has only gotten better over the years. 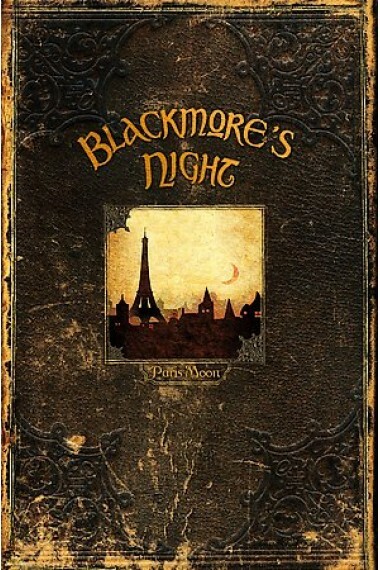 Playing the diverse material of Blackmore's Night affords the listener a very broad spectrum of style. Blackmore can be seen and heard playing everything from classical to blues in this show, and it's a real treat when it's done by the best in the business. The package itself defines elegance in every way. Besides content, of which there is plenty, the box is designed to open like an old and worn book. When you remove this "book" from the outer sleeve, it unfolds to reveal a booklet with photos and lyrics, as well as an 11-track audio CD in addition to the DVD. It's really an elegant package to hold in your hands. It turns out that my Blackmore's Night concert experience is quite an interesting one, and allow me to explain why that is. When I arrived at House Of Blues that night, it seemed that Live Nation and the venue themselves had both sold seats for the show. It was quite a mess, which found me starting on a bar stool that surrounded the main floor, and ended with my happy hiney planted in the front row after all the dust had settled. And it just so happens that I was on Ritchie's side of the stage, and he ended up serving me a beer in a beautiful pewter stein that has the band logo emblazoned across the front, and "Village Lanterne" engraved on the bottom. So, when I talk of "stein swinging crowd participation," I am speaking quite literally on my part. It truly was a night that will last forever in my heart, as Ritchie has always been a hero of mine. And, with this "Paris Moon" DVD, the wonderful spirit of that night can be yours as well.